The previous discussion uncovered an important principle that Satan uses division in order to divert the people of God, which will, in the final analysis, distract them and lead them in a direction that will destroy the aim of unity. So notice, finally, the destructive nature of division. The foundational observation is this. The first division that takes place after creation is the Fall of man in the garden. Simply put, our first parents experienced division when Eve usurped her husband’s leadership. There is not only horizontal division between Adam and Eve; there is the vertical division between people and God. God warned Adam that when he ate of the forbidden tree, he would surely die (Gen. 2:17). When Adam and Eve disobeyed Scripture tells us that “their eyes were opened” (Gen. 3:7). Consequently, they became enemies of God (Rom. 5:10), children of wrath (Eph. 2:1-3) and were enslaved to sin (John 8:34). Second, the sin of division is listed among the deeds of the flesh. The destructive nature of division becomes readily apparent when it is viewed in the context of Paul’s letter to the church at Galatia. Paul the apostle writes, “Now the works of the flesh are evident: sexual immorality, impurity, sensuality, idolatry, sorcery, enmity, strife, jealousy, fits of anger, rivalries, dissensions, divisions, envy, drunkenness, orgies, and things like these. I warn you, as I warned you before, that those who do such things will not inherit the kingdom of God” (Galatians 5:19–21, ESV). The word “division” is translated from a Greek word, translated as “heresy” or “faction.” While division may appear petty to some, it is listed among the sins of the flesh. And note, the warning, “Those who do such things will not inherit the kingdom of God” (v. 21). Jude 18-19 also includes a serious warning for people who cause division: “They said to you, “In the last time there will be scoffers, following their own ungodly passions.” It is these who cause divisions, worldly people, devoid of the Spirit” (Jude 18–19, ESV). Division is a serious sin that must not be tolerated among the people of God! Third, recognize that division destroys church families. Paul admonishes the church at Corinth, a church who became well-known for their carnal behavior: “I appeal to you, brothers, by the name of our Lord Jesus Christ, that all of you agree, and that there be no divisions among you, but that you be united in the same mind and the same judgment” (1 Corinthians 1:10, ESV). The present tense of the verb translated “appeal” demonstrates Paul’s urgency in putting this matter before the Corinthians. The word translated “divisions” comes from the Greek word that is commonly translated “schism.” The word implies a “tearing apart or splitting apart.” It also involves the opposition of sound doctrine. Suffice it to say, division will strike mercilessly against the very fiber of a local church. It will take on a life of its own. Division is a relentless enemy. Division is a vicious monster. It is a malignant cancer that will devastate and destroy. Division is a virus that must be confronted boldly and biblically. If divisive people are left unchallenged, they will annihilate a church from the inside out. Finally, division is contrary to the purposes of God. The apostle Paul pleaded with the church at Rome to be on guard against anyone who might introduce the cancer of bitterness in the church family: “I appeal to you, brothers, to watch out for those who cause divisions and create obstacles contrary to the doctrine that you have been taught; avoid them” (Romans 16:17, ESV). He uses a different Greek word, translated “division” here. The word means, “dissension or discord” and is virtually synonymous with the “schism” that we learned about in 1 Corinthians 1:10. Here is the takeaway: God hates division. God does not approve of factions or schisms. God, however, places a premium on unity. So we confess there is an indispensable need for unity in the church. As followers of the Lord Jesus Christ, may we stand in unity around the purposes of the church. May we stand in unity around sound doctrine. For we will not equivocate or compromise the doctrinal standards of the church. May the unity the emerges in the church begin with each faithful Christian and may it flow like “oil down Aaron’s beard” for the benefit of local congregations. And may the world take notice! May the world recognize that we are disciples of Jesus who stand together in unity which will be expressed in the kingly reign of Christ in a future day to come! Make no mistake – the devil despises unity. He will do whatever it takes to divide family and friends. He will pull out all the stops to divide a church or ministry. And he will work tirelessly in order to divide a country. One of the things that Satan hates the most is a unified church family. Note several reasons for the devil’s utter antipathy of unity. 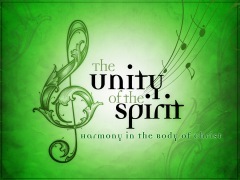 First, when God’s people are united, the body of Christ works as God intends – harmoniously. Paul speaks of this unity in 1 Cor. 12. “But God has so composed the body, giving greater honor to the part that lacked it, that they may be no divisions in the body, but that the members may have the same care for one another. If one member suffers, all suffer together; if one member is honored, all rejoice together” (ESV). Here we see that the whole is greater than the sum of the parts. God is honored and glorified when the body of Christ works in a harmonious fashion; when the people of God are mobilized and faithfully exercising their God-given spiritual gifts. Satan on the other hand, loathes the very notion of unity with a devilish passion. Second, when God’s people are united, the gospel goes forward in great power. We see this demonstrated most vividly in the book of Acts. In Acts 1:8, the apostles receive a promise; a promise of the Holy Spirit’s power that will accompany their ministry as they faithfully proclaim the gospel to the nations. In Acts 2, the day of Pentecost arrives and Peter preaches a bold sermon that results in the conversion of 3,000 people (Acts 2:41). As the people of God devote themselves to the purposes of the church (Acts 2:42), God faithfully “added to their number day by day those who were being saved” (Acts 2:47). In Acts 4:4, we witness the conversion of 5,000 more people as they sit under the preaching ministry of Peter. This pattern occurs over and over in the book of Acts. When the people of God stand united, the gospel goes forward in great power – all the more reason for the devil to despise a united church. Third, when God’s people are united, Christ’s agenda triumphs over people’s personal agendas. Here’s a principle to remember: Rejecting bickering results in rejoicing together. When personal agendas are set aside for kingdom purposes, Christ’s agenda prevails. So the devil will work strenuously to pit believer against believer. Woe to the church who passively sits by while the personal agendas of carnal people win the day. When personal agenda strike at the core of the local church, the devil has gained a major victory. Fourth, when God’s people are united, God is greatly glorified. When forgiveness is at the center of a church family and grace marks the ministry, people are encouraged and God receives the glory. When selfish agendas are cast aside, God is glorified. When “pet projects” are shelved in order to defer to a higher purpose, God is glorified. Paul notes, “For it is all for your sake, so that as grace extends to more and more people it may increase thanksgiving, to the glory of God” (1 Cor. 4:15, ESV). We have uncovered some reasons why the devil hates unity. But it does not end here. Satan not only hates unity; there is something he loves, namely, division. The devil relishes a people who are divided. He is eager to promote division, especially in the church. So notice several reasons for the devil’s love of division in the church. First, when the church is divided, effectiveness fades. Nothing could be plainer. When people are at war, the troops lose strength and effectiveness wanes. Quite honestly, division takes work. And while the people who are engaged in division grow weak, it is the faithful efforts of shepherds that are ultimately affected. I often wonder if people who spark division really understand how pleased the devil is with their work. Second, when the church is divided, ministry morale declines. This principle is related to the previous one. For whenever division takes root in a church, ministry morale by definition will be on the downgrade. Third, when the church is divided, the flesh is stirred to action. I have learned from experience that when a group fosters division in a church, their sinful activity has a stunning effect. It actually brings out the worst in people. It serves, if you will, as a sin catalyst – igniting the flesh in people who moments before were faithfully serving God. It is no wonder that the devil has such a passion for division. Fourth, when the church is divided, the gospel is tarnished. I was never much of a math student but here’s an equation I understand and have seen firsthand over the years. Gossip + division = a lack of love. And if we take John 13:35 seriously and affirm that people will recognize that we are disciples because of the love we show one another, it stands to reason that a divided church actively and aggressively tarnishes the gospel. Francis Schaeffer rightly notes that the “final apologetic” is our love for one another and the unity expressed in the context of relationships. I’m convinced that Satan is perfectly happy to see the gospel being proclaimed by a divided church – because the luster of the gospel is being adulterated which results in a weak, tepid, and ineffective message. May God help us! Fifth, when the church is divided, the Holy Spirit is quenched and grieved. When Jesus prayed the High Priestly prayer in John 17, he said, “I do not ask for these only, but also for those who will believe in me through their word, that they may all be one, just as you, Father, are in me, and I in you, that they also may be in us, so that the world may believe that you have sent me” (John 17:20-21, ESV). In other words, the Trinity has from all eternity been in perfect fellowship and unity. So when disunity invades a church, it strikes at the core of who God is. Division militates against what is precious to God, namely, unity. The Holy Spirit, therefore, is quenched and grieved when division puts a stranglehold on unity. Sixth, when the church is divided, God is not glorified. Of course, whenever a church is divided, God is not honored. And when God is not honored and glorified, we find the devil grinning ear to ear. I heard a pastor say a few days ago that he “does not believe in the devil.” Now the arch-enemy of our souls is really smiling. He’s not only managed to spark division in the church; he’s convinced one of the leaders in the church that he is only an imaginary enemy. So we come back to the primary assertion, namely, there is an indispensable need for unity in the church of Jesus Christ. A church that fails to live up to the biblical ideal is a disobedient church; a church that is marginalized; a church that is weak and ineffective. May God give us strength to obey the mandate before us. May we stand side by side in unity all for the great namesake of the Lord Jesus Christ. Over the last few days, we have defined unity and discovered some critical marks of biblical unity. Today, let us mark out the deterrents to unity; roadblocks that prevent God’s best in the local church. The first division that occurred in marriage took place in the garden between our first parents, Adam and Eve (Gen. 3:1-7). Eve was deceived by the serpent. Her deception led her down a slippery slope which resulted in her usurping of Adam’s headship; headship that was granted by God. Adam relinquished his God-given role as the leader in his marriage and stood by passively. The division that took place in the garden led to what I call the post-fall propensity. Adam’s sin plunged humanity on a sinful path that leads to death (Rom. 5:12). The post-fall propensity affects both men and women in marriage to this day. Men struggle with one of two sins in this area. They struggle with being docile – the sin of passivity (Gen. 3:6-7) and they struggle with dominating their wives (Gen. 3:17). Both sins result in the ungodly abdication of the leadership role that is granted by God. Additionally, in this arena, women struggle with usurping their husbands’ authority (Gen. 3:17). This sin expresses itself in ungodly assertiveness. The combination of ungodly abdication and ungodly assertiveness leads to a sharp and contentious division in marriage. Nothing will marginalize a church quicker than a leadership team that is divided. There are two broad areas to consider. The first involves a person or group of people who make efforts to divide a leadership team. Often times, unexposed sin motivates such an effort and must be dealt with swiftly or sin will eat through an organization like a cancer. When Paul confronted the sexual sin at the church in Corinth, he warned, “Do you not know that a little leaven leavens the whole lump? Cleanse out the old leaven that you may be a new lump, as you really are unleavened” (1 Cor.. 5:6-7). Sin that is allowed to fester is like unwanted mold or rust that continues to grow until it destroys everything in sight. The second kind of division may involve two godly people who disagree on a theological matter or the direction of a given ministry. Paul and Barnabas disagreed on a matter that led them to go their separate ways (Acts 15:39, ESV). Barnabas sailed to Cyprus with Mark at his side and Paul traveled to Syria and Cilicia with Silas. The fascinating result is found in Acts 15:41 – “And he went through Syria and Cilicia, strengthening the churches.” These men understood the deadly danger of division and determined to maintain the unity of the church by separating and going in different directions. Gossip is a sin that appears to be tolerated in many churches. This should never be – for gossip is a serious sin in the eyes of God. Ezekiel 36:3 refers to gossip as an “evil” activity. Paul includes gossip along with a list of other sins including covetousness, malice, envy, murder, strife, deceit, and maliciousness (Rom. 1:29, ESV). Gossip is listed among other sins like quarreling, jealousy, anger, hostility, and conceit in 2 Corinthians 12:20. Proverbs 16:28 says, “A dishonest man spreads strife, and a whisperer separates close friends.” And Proverbs 17:9 warns, “Whoever covers an offense seeks love, but he who repeats a matter separates close friends.” Indeed, gossip should not be found among the people of God. Gossip has the power to divide and even destroy a church. Hang around a local church for any amount of time and one is bound to find people with personal agendas. Worship styles, philosophy of ministry, polity, and a whole laundry list of items contribute to this thorny matter. Yet Scripture calls us to put the needs of others before our own; we are called to humble ourselves and seek the good of others. Personal agendas left unchecked will fester and spark division in the church. Personal agendas can dismantle the unity of a church almost overnight. Finally, people who politic and form splinter groups to oppose the leadership pose a grave threat to the unity of the church. We will examine this problem in the next post. But suffice it to say, these schisms not only hurt the unity of the church; they displease the Savior and cast a long shadow on the Bride of Christ; a shadow which extends into the world and communicates a message that does great harm to the church. These deterrents to the unity of the church must be identified, confronted, and challenged with the full weight of biblical authority. Again, we aim for unity in the church. I’ll never forget the time I bumped into a pastor at the store one day. We served together for some time in ministry and enjoyed a good friendship and working relationship. I asked, “How have you been?” He proceeded to tell me about the church he was serving at and how one of the members had leveled some horrible accusations against him; accusations that were not true in any way, shape, or form. These accusations began to swell and before long the pastor was driven out and the church eventually disintegrated. There is an indispensable need for unity in the church of Jesus Christ. God places a premium on unity. The one God who has revealed himself in three persons has from all eternity been united; in perfect fellowship. And the Trinity will be unified unto all eternity. Indeed, this is his call to the church. King David unfolds the blessings of unity in Psalm 133:1-3. He begins, “Behold, how good and pleasant it is when brothers dwell in unity!” In verses 2 and 3, compares unity to the precious oil that ran on the head of Aaron which ran onto his beard and down the collar of his robes. He compares unity to the dew of Hermon, which falls on the mountains of Zion. Unity points to the community. It suggests the state of being one where the whole is greater than the sum of its parts. The essence of unity is harmony. This is the call of the church – to be unified. Yet a quick survey of local churches reveals a disturbing trend. Many of these churches may appear to be unified externally but are on the verge of collapse on the inside. Notice three New Testament examples of this call to unity. Paul uses a Greek word here, translated as “unity” which is a “oneness.” It is important to see that unity is tied to humility, gentleness, patience, and longsuffering. We can safely say that to the degree that these qualities are absent in the church – to that degree disunity will prevail. God places a premium on unity; so much so that it stands at the heart of God’s purposes for the church. And note its aim, namely, mature manhood, “to the measure of the stature of the fullness of Christ.” In order to be unified in the way that God intends, we must be growing deeply in the soil of God’s grace. So churches that marginalize theological pursuit are in danger of disobeying this important component of church life. Churches that get caught up in pragmatic approaches to ministry miss out on the blessing that unity brings! Peter uses a different Greek word here. It is a word that means, “the state of being united; a thing forming a complex whole; like-minded.” I serve at a church where the men gather on a regular basis to weigh-in on important decisions and shepherd the flock of God. From time to time, we have strong opinions on a given issue, yet something incredible always happens. We always leave the meeting united. My prayer is that the same spirit would permeate the local church. Sometimes we agree to disagree. This is part of life. But when a decision is made, we must make a conscious decision to be unified. May unity mark churches that embrace the biblical gospel of Jesus Christ. May we stand united around the purposes of our Savior for the glory of God!